Craft Table and Tap is the newest venture of Food Fight Restaurant Group. Food Fight operates close to 20 restaurants in the Madison, WI area. My favorite of them all being Hubbard Avenue Diner. Each Food Fight restaurant has a somewhat unique atmosphere while giving off a similar vibe. They like to keep things local and put a spin on classic dishes. While I wouldn’t call much of what they have to offer healthy, they do offer plenty of vegetarian options at most of their restaurants. Prior to chatting with my mom on Monday morning, I hadn’t yet heard of Craft Table and Tap. She mentioned that she read about it in The Isthmus and wanted to give it a try. So we did just that. The decor was simple, certainly nothing to write home about. A large room with a decent-sized bar, booths along the windows, and tables filling the middle area. Our server wasn’t friendly, nor was she unfriendly. I don’t think she cracked a smile, but wasn’t completely unpleasant, just seemed…flustered? Maybe? Or uninterested. Yeah, uninterested is more like it. We were there a bit later than when you would expect a normal Monday lunch rush and they weren’t very busy. 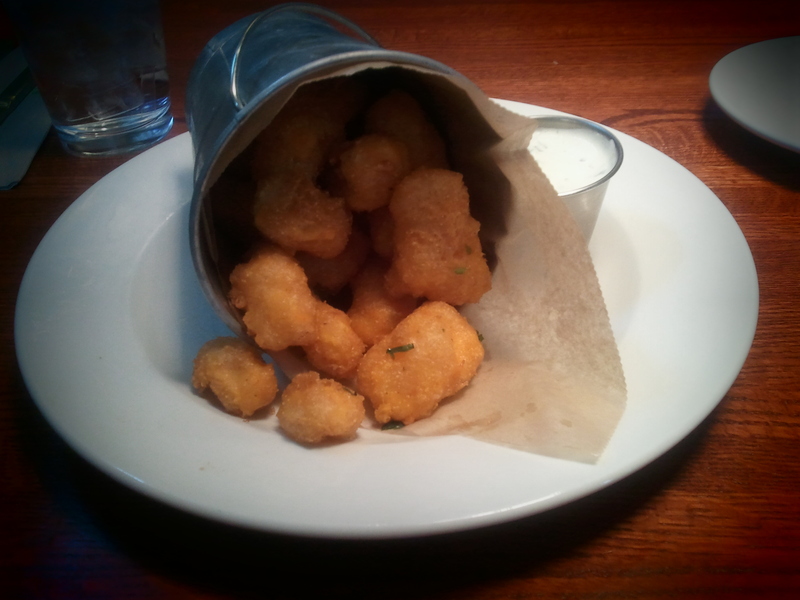 We started off with the cheese curds. I loved the presentation. A cute little bucket, lined with unbleached deli paper, tipped on it’s side, spilling the cheese curds onto the plate upon which the bucket rested. Local cheese from Carr Valley Cheese covered in a tasty batter, served with a side of ranch dressing. I probably could’ve made a meal out of these. They were seriously yummy. The menu wasn’t huge, probably just the perfect amount of stuff to choose from for lunch, but I might like to see a few more options if I were going for dinner. 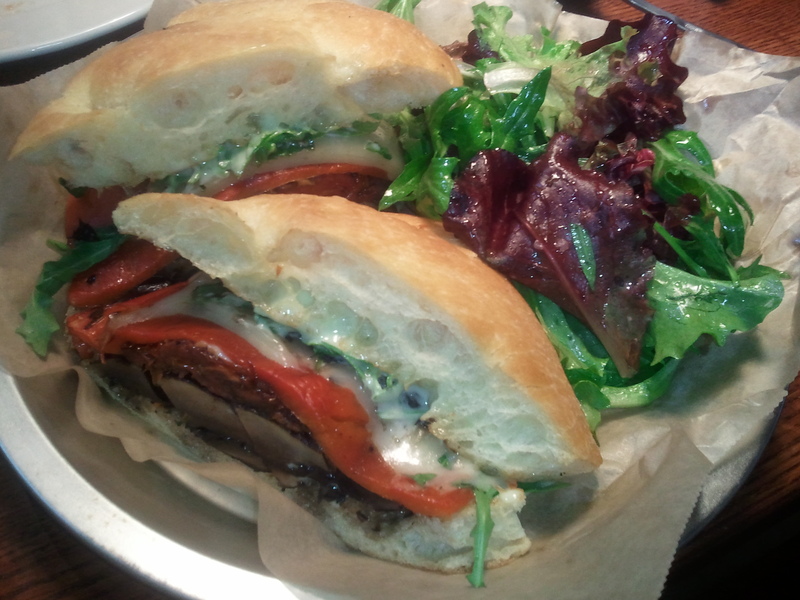 I decided to try the Portobello and Arugula Sandwich. With each sandwich you get a choice of fries, mixed greens, or mac and cheese as your side. Since I’d already gone the fried and cheese routes with the cheese curds, I went with the mixed greens. arugula, fontina cheese, and truffle mayonnaise on griddled focaccia. And it was pretty much that. I think I tasted the truffle oil the rest of the day and I’m not exactly sure what griddled focaccia means, but I think I expected it to be a bit more panini-ish? Overall, it was good and I ate just about the entire sandwich. The mixed greens were just that, mixed greens, tossed in a tiny bit of oil. My mom had the Grilled Chicken and Bacon sandwich with a red pepper mayo. It was pretty straightforward also. Simple food, served simply. Not a bad thing in my book. I will definitely go back again when I’m able to try a few brews from their extensive beer menu, with many local offerings. I also noticed that they have poutine on their menu, which is something I’ve always wanted to try. Have you tried any new places lately? What did you think?